Sri Lanka’s e-com pioneer Dulith Herath says in exclusive interview discussing how his network of online retail facilitators, from ‘Kapruka’ to the latest ‘Grasshoppers’, gives Sri Lankan businesses everything they need to ace the online retail game. “Sri Lankan businesses need to take a good look at how dinosaur enterprises were affected in bigger markets across the world. They were big, once relevant but completely outdated when the digital revolution happened and the online buying culture erupted. It became a fast downfall to those dinosaurs. But, we don’t have to repeat the same mistakes here. There’s room to change, but not much time. So, now is the time you need to get behind this, before it’s too late,” says Dulith Herath. 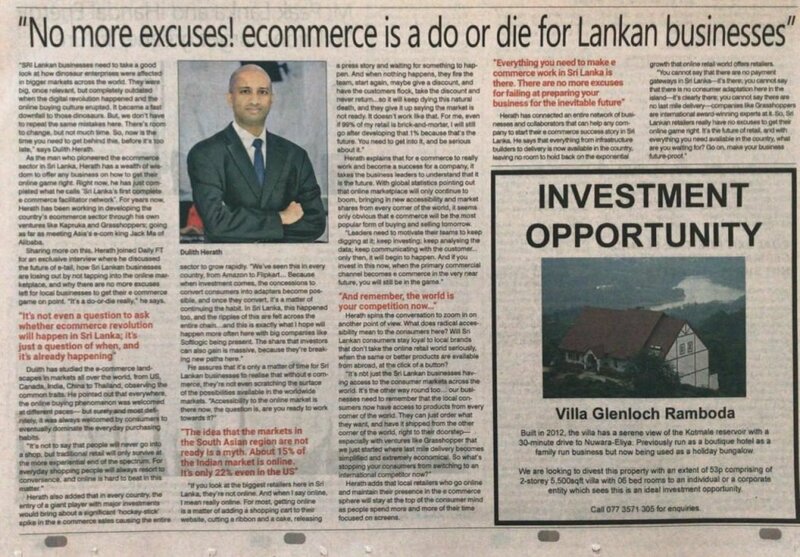 As the man who pioneered the ecommerce sector in Sri Lanka, Herath has a wealth of wisdom to offer any business on how to get their online game right. Right now, he has just completed what he calls ‘Sri Lanka’s first complete e commerce facilitator network’. For years now, Herath has been working in developing the country’s ecommerce sector through his own ventures like Kapruka and Grasshoppers; going as far as meeting Asia’s e-com king Jack Ma of Alibaba. Sharing more on this, Herath joined Daily FT for an exclusive interview where he discussed the future of e-tail, how Sri Lankan businesses are losing out by not tapping into the online marketplace, and why there are no more excuses left for local businesses to get their e commerce game on point. “It’s a do-or-die really,” he says. Herath adds that local retailers who go online and maintain their presence in the e commerce sphere will stay at the top of the consumer mind as people spend more and more of their time focused on screens.